On a slow adventure trip to the Isle of Rum sea conditions were far from perfect, fresh southerly winds with consistent rain has me wondering if this was the right call but we are excited to show our Texas guests this beautiful wild island. Having organised a wildlife ranger tour of Kinloch harbour which gives us shelter from the elements, we then had a quick stop off for refreshments at the tearoom. Its then into the jeeps for a trip to Harris bay on the west side of the island. On the steady climb up Kinloch Glen the rain stops and the mist lifts to reveal the dramatic Rum Cullin with the large red deer population peppered on the slopes. 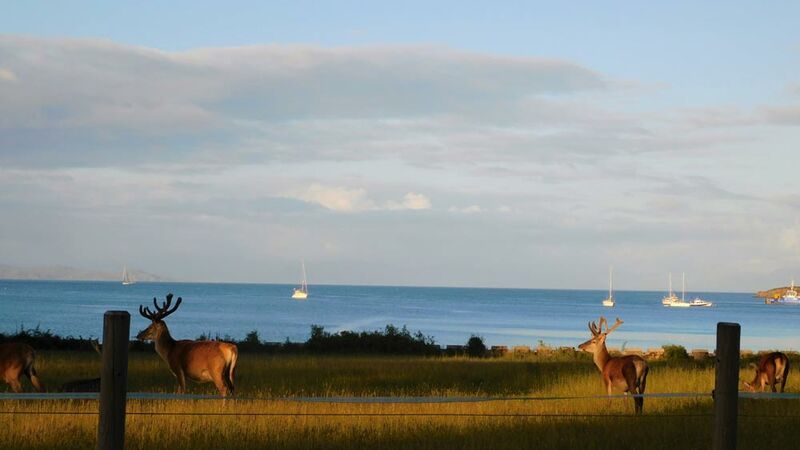 The guests are in awe with this wild land and fully appreciate the fact that we are all alone. As we pass the lochs on our left the men in the group are eager to fish, I nudge them on pointing into the west to Harris Bay. On arrival at Harris Bay, stunning, beautiful and remarkable are just some of the comments spoken out loud. 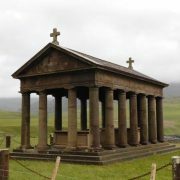 There is no sign of the wild ponies but there is an array of sea birds, wild goats and highland cattle surrounding the mausoleum which looks like it belongs in ancient Greece and not the Scottish Highlands. The return leg has us fishing in what I call ”trout fisherman’s heaven” Loch An Dornabach, we take a brace of buttercup coloured trout back to Kinloch to BBQ while meeting some local characters who share some ales and play a few tunes on the guitar. 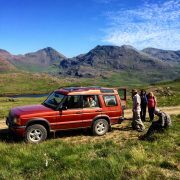 The company is good, the craic is flowing and the time just disappears, its 8.30pm and its time to go I’m afraid, heading back to Knoydart with the sun setting behind us we can agree it was the perfect immersion into a Highland culture delivered to our Texas guests.